What happens if we stop, take time out to be aware of ourselves, of other people, and of the world? Leeds Buddhist Centre is a group of friends exploring the Buddhist Path, including meditation, bodywork and Buddhist teachings, cultivating clarity, kindness, energy, sensitivity and calmness. Opportunities for newcomers, regular meditation practice, ritual, retreats, social and cultural events. The centre is part of the Triratna Buddhist Community. We are a new tradition, drawing from different Buddhist traditions and presenting the Buddha’s teachings in a way that is accessible to many of us in the west. For general enquiries see details below. Our new centre is located at Leeds Bridge House on Hunslet Road in the city centre (see map below). Please do not confuse us with the similarly named Bridge House, located further away from the city centre but also on Hunslet Road). 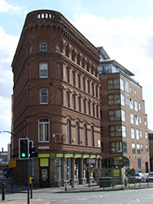 The Buddhist Centre is about 10 mins walk from the bottom of Briggate. Cross Boar Lane and continue down to Briggate under the railway bridge. Cross the Calls and continue over Leeds Bridge. The Centre is on the top floor of the triangular shaped building in front of you. There are pay and display car parks right next to the Buddhist Centre and also in the centre of Meadow Lane. These are free in the evening. The picture on the top left shows the building as you approach it. Go to the right of the building and the entrance to Triratna Leeds Buddhist Centre is towards the rear of the building. Press the buzzer to gain entry and come up to the fourth floor. Note: this statement only covers aspects of physical access for disabled people to Triratna Leeds Buddhist Centre at Leeds Bridge House. Entrance: Access is gained via an intercom, located to the left of the main door. The intercom buzzer, for the 4th floor is 1350mm from the floor. There is a 30mm step from pavement to entrance door. The door clearance is 870mm. Lift: The lift door clearance is 770mm. The lift car is 1240mm from front to back. The height of controls is 1000mm. Wheelchair users will need to reverse out of the lift once they reach the 4th floor. Access to the Triratna Leeds Buddhist Centre from the 4th floor lift lobby: is via a door with a 750mm clearance. Once inside the area rented by Leeds Buddhist Centre, all the facilities are level access. The main shrine room is accessed directly; the small kitchen/library is off the shrine room, accessed through a door with a 750mm clearance. WCs: There is a single toilet cubicle on the same floor as Leeds Buddhist Centre. This is accessed via the 4th floor lobby passing through one door with a clearance of 720mm and another door with a clearance of 715mm. The 2nd floor WC is adapted to be accessible for wheelchair users or other disabled people. This can be reached from the lift through doors on the 2nd floor with clearance of 750mm.